Cruise ship MS Deutschland is a national institution. Much loved by traditionalists in its home country, the 480-passenger vessel is familiar to millions as the setting for long-running German TV soap Traum Schiff – a derivative of America’s Love Boat. 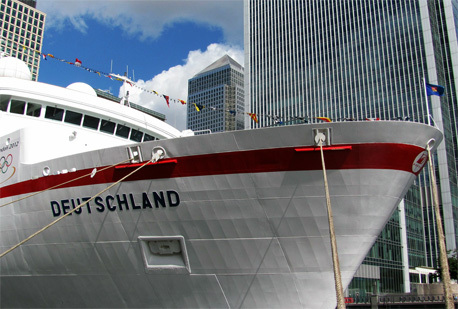 Over the next two weeks the 14-year-old ship is berthed in London, providing accommodation for members of the German Olympic Committee and visitors to the Champions Club. At the end of the Games, it will take athletes back home, on a short voyage from the Thames to Hamburg. German president Joachim Gauck was a visitor to the ship on Saturday, attending a reception hosted by the his country’s ambassador to London; yesterday I was among a small group of journalists and travel agents invited to take a look round and have lunch in its Four Seasons restaurant. We were shown around its magnificent public rooms, redolent of another era, and relaxed in the Lili Marlene bar, where one corner is preserved as a shrine to the late owner, Peter Deilmann, We were even led onto the bridge, from where we had the finest view of the billions of pounds-worth of private yachts which are also at South Quay, where their fabulously wealthy owners and some very fortunate guests are staying during the Olympics. But we remained unaware of the high drama that was going on behind the scenes. Venture capitalists Aurelius Investments, who now own the Peter Deilmann company, had caused consternation by announcing that the registration of MS Deutschland was being transferred from Germany to Malta. 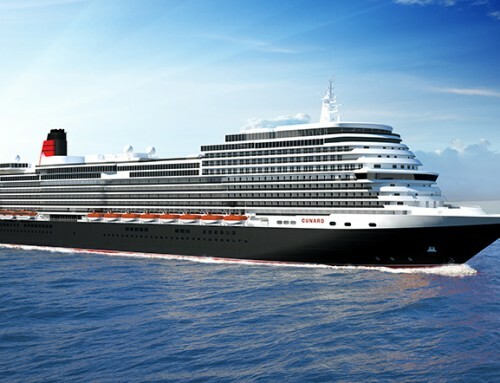 Cunard undertook a similar exercise a few months ago, changing from the UK to Bermuda – which they said was in order to permit weddings to be carried out on board. 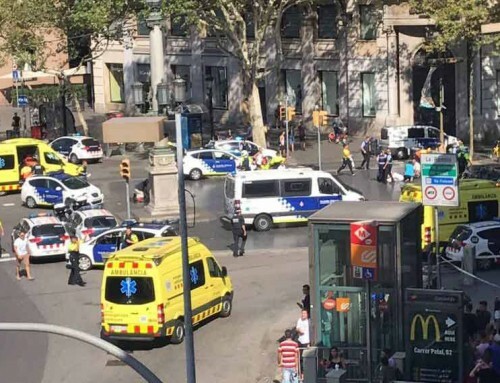 No such explanation was out forward for the Deutschland decision; it would have been unlikely in any case, given that the average passenger age is 75. A representative of the operators was quite open at lunchtime, stating unequivocally that the move was in order to reduce labour costs – although they had decided to defer the switch until after the ship’s prestigious visit to London. 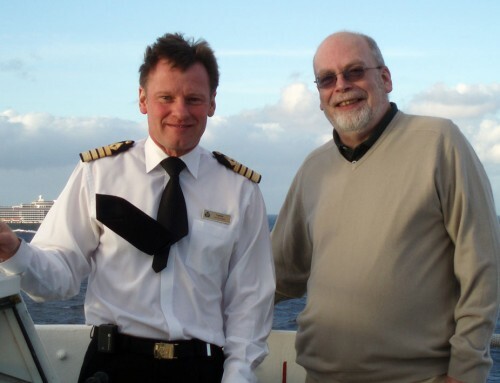 But Aurelius had reckoned without the strength of public feeling in Germany, and the determination of the ship’s Captain, Andreas Jungblut (left), who last week wrote to President Glauck asking for his support and stating “you can’t change a flag like you would an undershirt. The crew of the Deutschland believe that our ship could sail very economically under the German flag,” he wrote, according to German tabloid newspaper Bild. In their own letter to the president stressing the need for restructuring, the company appeals for help in meeting debt repayments of about €6 million and an operating loss of €1.5 million in 2011. Germany’s Olympic team, whose medal haul so far consists only of a single silver in the fencing, will no doubt join the ship’s loyal passengers in hoping that a solution to the crisis will soon be found – and that Captain Jungblut will return to the helm. Two days after its unexpected decision to keep the Deutschland under German flag, Reederei Peter Deilmann made another surprising announcement: Two of its three managing directors are resigning. Andreas Demel and Marcus Mayr will leave by Aug. 15 ‘because they do not want to go along with the decision against a registry shift,’ the Neustadt-based company said, adding that Deilmann and its owners thanked both executives for their commitment to the company’s restructuring since October 2010. Deilmann’s third md, long-time cruise industry figure Konstantin Bissias, is going to stay. A new md supporting him at the company’s helm has already been appointed. Seatrade Insider understands Frank Thueringer is a financial expert linked to investor Aurelius AG, which owns 95% of Reederei Peter Deilmann.